Cloud storage services like Dropbox and Google Drive allow you to have only one folder on the computer the content of which will always remain in sync with your online account. Any files that you place in this particular folder can be accessed from the web or any of your other computers and mobile devices. If you would you like to store files from other local folders in your Dropbox, you can either move these folders inside the main Dropbox folder or you can get hold of a free utility called MacDropAny. This app will allow you to sync folders outside your main Dropbox folder with Dropbox but without you having to move these folders anywhere. To get started, download MacDropAny and copy it to your Mac Applications folder. 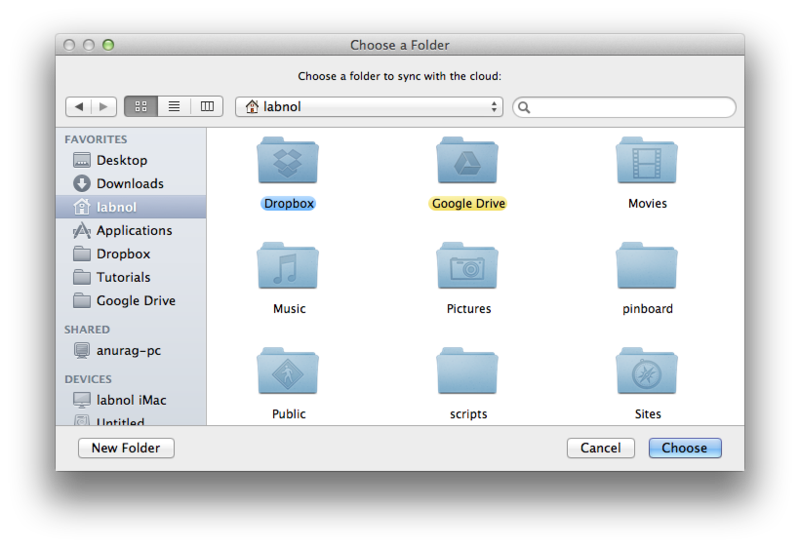 Now launch the app and it will ask you select a folder on your Mac that you would like to sync with Dropbox (or Google Drive). Next select the folder inside your main Dropbox folder where you would like this external folder to go. You may even choose the root Dropbox folder here. There’s an alternate way as well. Just drag any Mac folder, drop it over the MacDropAny icon and choose the location of the Dropbox folder. That’s all it takes to add any external Mac folder in your Dropbox queue. What the MacDropAny application just did is it created a symbolic link, or soft link, in your Dropbox folder that points to the external folder. Advanced users can directly run the command “ln -s” inside the shell terminal to create these links manually without requiring any app. MacDropAny is available for Mac only and works with Dropbox, Google Drive, Box and other cloud storage services that impose the one-folder-only restriction. Windows PC users may download the free SyncToy utility from Microsoft to backup external folders with Dropbox.